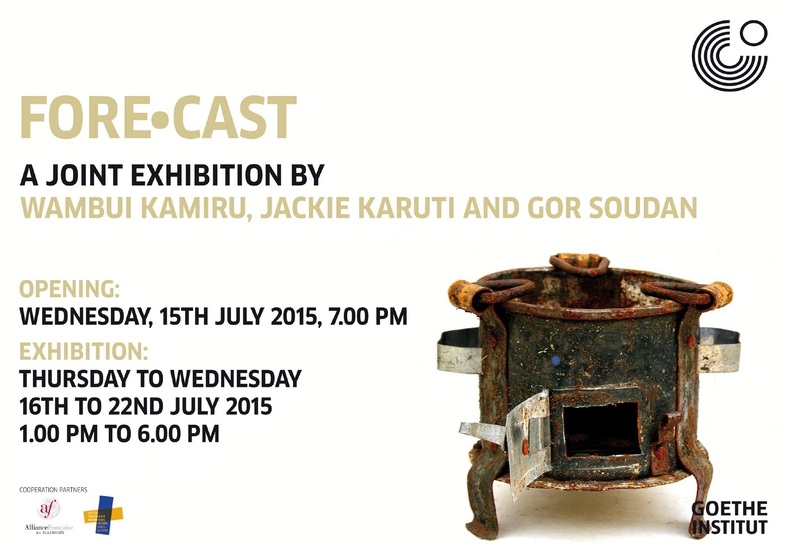 Fore•cast is a collaborative exhibition by Gor Soudan, Jackie Karuti and Wambui Kamiru that explores how past, present and future action are linked in creating a shared human experience, through looking at a time when things “were”. Gor Soudan presents “More deader and outer things” between earth and heaven, an installation that dissects the evolving contemporary urban space we occupy, and how it interacts with everything else that surrounds us. Jackie Karuti presents “Time Capsule”, an installation piece that incorporates video and found objects to recreate the idea of preservation and memory. A set of decaying refrigerators are re-purposed by the artist, who then inserts a set of memories typical of events happening in a certain past or present time. Wambui Kamiru presents “Tree”, an installation about the distance between life and loss. Using the symbol of a tree, Kamiru creates an experience of life and death and the human role in bringing about both extremes. “Seer” is a performance piece conceived by Gor Soudan. He invites the artist Jackie Karuti to incorporate objects from his installation to create sound, and the result is an intimate performance that gives voice to these objects. Karuti performs live on the opening night, the video documentation of the performance will be screened for the duration of the exhibition.